Gardeners with shady lots often assume that they cannot grow vegetables, but that's not necessarily the case. While there are almost no vegetables that will grow in full shade, as long as you have a bit of direct sun--or a high tree canopy that permits dappled light to come through -- there are quite a few options. All the following recommendations are annual vegetables that can be grown in all zones. This tangy salad green prefers part shade, especially in summer when the heat causes it to go to seed prematurely and become bitter. In summer, it will thrive with as little as 2 hours of direct sun, while in spring and fall it is better off with 3 or 4 hours. 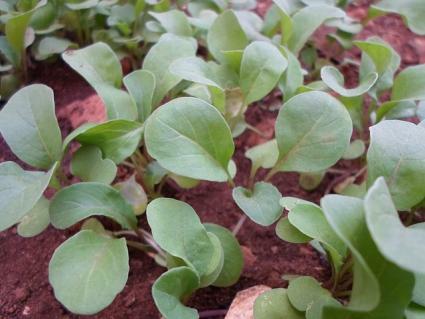 Plant arugula seed directly in the ground as soon as the soil can be worked in spring. If you would like a continual harvest of this fast-growing green, sow it again every 4 to 6 weeks until the first frost of fall. Arugula grows well in soil with low fertility, but needs regular irrigation throughout its life cycle. You may not get large dense heads of lettuce in partial shade, but you will be able to harvest plenty of leaves as long as you have 3 hours of direct sun. Lettuce actually tastes better when grown in the shade during the summer months. Sow lettuce seeds indoors 4 to 6 weeks before the average date of last frost, or directly in the ground after all danger of frost has passed. Keep sowing it every 6 to 8 weeks up until the first frost of fall. 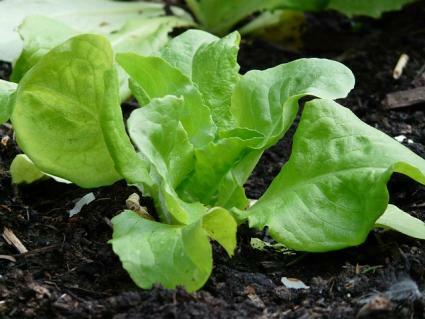 Lettuce likes rich soil and regular irrigation. Simply harvest the outer leaves as they mature and allow the smaller inner leaves to keep growing. 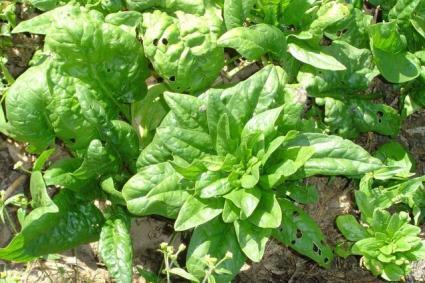 Spinach is actually hard to grow in the summer without a bit of shade as it will "bolt" (send up flower stalks) and become bitter in the hot weather. Spinach should have 3 to 4 hours per day of direct sun in spring and fall though it will survive on a bit less in summer. Plant spinach seeds directly in the ground as soon as the soil can be worked in spring. If you want to harvest it as baby spinach, sow seeds every 4 weeks for a continual harvest. For full heads of spinach, sow at 8 week intervals. 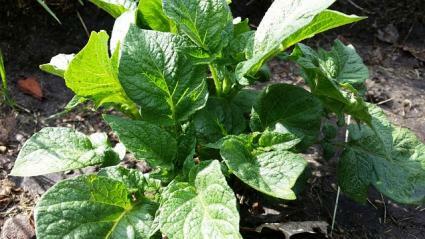 Spinach needs the best possible topsoil, so it's helpful to enrich the beds with compost prior to planting. Water regularly throughout the growing season. Your potatoes will not be as large or as abundant if grown in partial shade, but they will produce a worthwhile crop as long as they get at least 4 hours of sun. They will also take a bit longer to mature, but homegrown potatoes are so tasty that it's worth the wait. Potatoes are planted with seed potatoes, which are available in garden centers in early spring, as soon as the soil can be worked. You can also take organic potatoes from the store and cut them into 2-inch chunks to use as seed potatoes-- just make sure there is at least one 'eye' on each chunk. The richer the bed, the better the potato harvest, so be sure to enrich the soil with compost prior to planting. Potatoes are planted 6 to 8 inches below the surface, so the soil needs to be worked to a depth of 10 or 12 inches. Potatoes need water only when the soil is dry at a depth of 4 or 5 inches, otherwise they may rot. Beets need at least 3 or 4 hours of sun per day to produce a good crop. They may not get as big, so feel free to harvest them when they seem to stop growing, as the flavor will only diminish the longer they sit in the ground. Sow beets directly in the garden around the average date of last frost and every 3 weeks thereafter for a continual harvest through fall. They are light feeders, so no need to enrich the soil with too much with compost. Also, avoid high nitrogen fertilizer, as it leads to leafy growth rather than a crop of juicy beets. Water whenever the top inch of soil is dry. Peas need 4 or 5 hours of direct sun to produce a satisfactory crop. 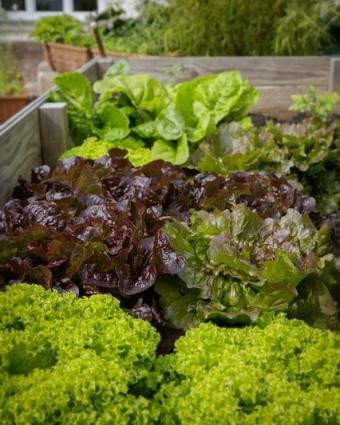 As with some of the other cool weather vegetables, providing them with some shade is the only way to achieve a harvest through the summer in hot climates. 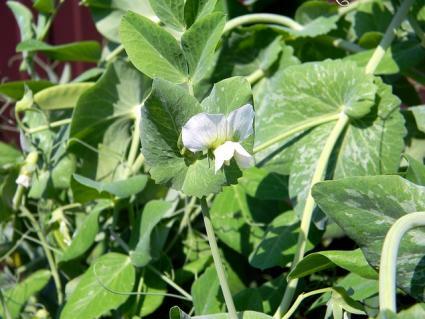 Plant pea seeds directly in the garden after all danger of frost has passed. They will need a trellis about 4 feet tall to grow on. They thrive in soil that has been enriched with a small amount of compost, but should not receive much nitrogen fertilizer. Water regularly and sow a second crop in mid-summer for a fall harvest. Garlic will mature with as little as 4 hours of sun per day, but you can still harvest "green garlic" with a bit less sun than that. 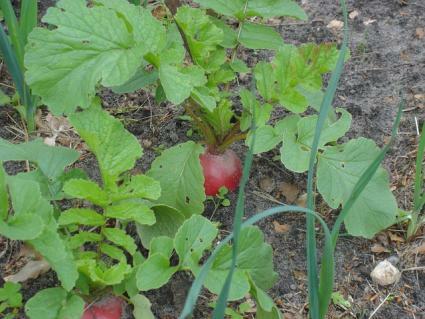 Related vegetables such as onions, leeks, and scallions can be grown in part shade vegetable gardens as well. 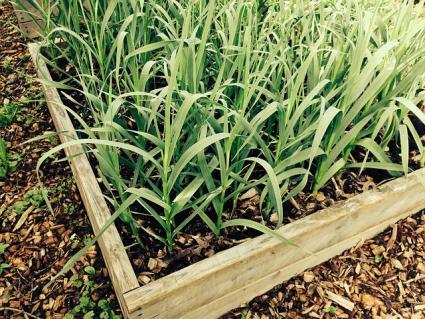 Plant garlic as soon as the ground can be worked in spring. Buy 'seed garlic' at a nursery or simply plant cloves of organic garlic from the store. Garlic grows best in rich, well-drained soil. Do not water excessively or the cloves may rot. When the garlic ripens in early fall, a second cop may be planted for harvest the following spring. Kale grows with as little as 3 hours of sun per day. It is one of the best vegetables for a shady garden because the shade allows it to be grown right through the summer when kale plants in full sun often fail to thrive. 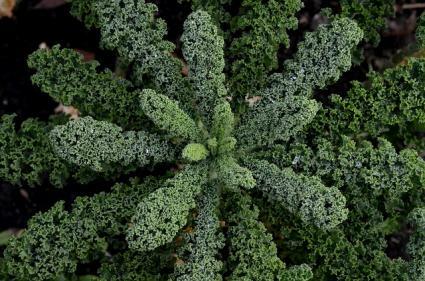 Kale seed is typically planted indoors 4 to 6 weeks before the average date of last frost and then transplanted to the ground after all danger of frost has passed. It is a relatively long-lived vegetable and does not need to be replanted until the following year. In mild winter climates, kale can even be harvested right through the winter. Provide kale with a bed of rich soil and water regularly. Contrary to popular belief, some vegetables actually do better when grown in part shade, especially when it comes to leafy greens and root crops. As long as you have three or four hours of sun, you can still grow quite a cornucopia.